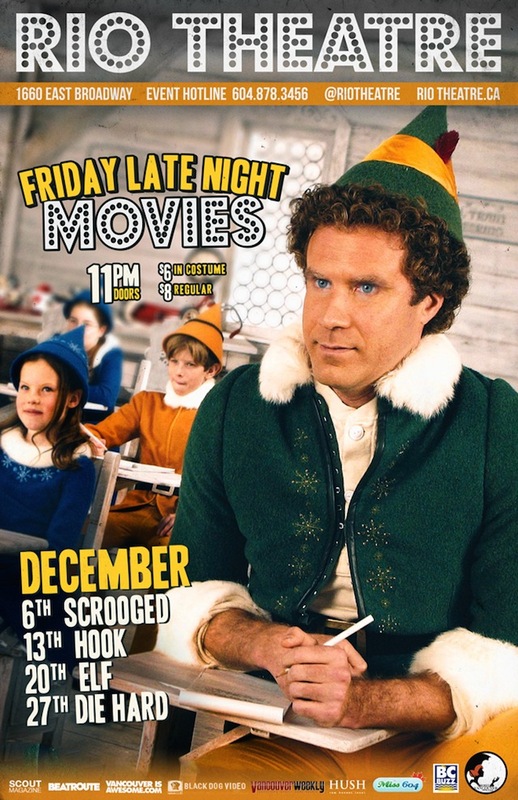 The Rio Theatre is serving up a bundle of holiday favourites as this month’s Friday Late Night Movies. These 19+ screenings can be complimented with a beverage from the theatre’s full service bar as you enjoy a night out with friends. Tickets are available online in advance or at the door for $8 or $6 if you come in costume. We’re kicking off the Holiday season with a Friday Late Night screening of Richard Donner’s Scrooged, featuring a pitch-perfect Bill Murray in a classic re-telling of Charles Dickens’ timeless tale. The star-studded cast also includes Karen Allen, Alfre Woodard, John Forsythe, Carol Kane, Bobcat Goldthwaite, Robert Mitchum and… Robert Goulet! This 90s fan favourite has been oft-requested by our retro-loving audience, and the holiday season seemed like the perfect time to replay it. Steven Spielberg’s star-studded cast (featuring Robin Williams, Dustin Hoffman, Julia Roberts, Bob Hoskins, Dame Maggie Smith and an adolescent Gwynneth Paltrow) is a modern take on a childhood classic. When Captain Hook kidnaps his children, an adult Peter Pan must return to Neverland and reclaim his youthful spirit in order to challenge his old enemy. This place reminds me of Santa’s Workshop! Except it smells like mushrooms and everyone looks like they want to hurt me… | Director Jon Favreau’s surprisingly sweet story about a man named Buddy (Will Ferrell, in one of his most endearing performances), an orphan inadvertently raised as one of Santa’s elves who decides to travel to New York City to find his birth father, became an instant classic upon its release a decade ago. Elf features memorable supporting turns from the likes of James Caan, Zooey Deschanel, Bob Newhart, Mary Steenburgen, and Ed Asner. New York City Detective John McClane (Bruce Willis) has just arrived in Los Angeles to spend Christmas with his wife (Bonnie Bedelia). Unfortunately, it is not going to be a Merry Christmas for everyone. A group of terrorists, led by Hans Gruber (the always wonderful Alan Rickman), is holding everyone in the Nakatomi Plaza building hostage – including Mrs. McClane! With no way of anyone getting in or out, it’s up to the street-smart (and barefoot) McClane to stop them all and save the day.